Kirk and Cathy are traveling, eating, doing important stuff, or maybe just resting today. So Ed (from Yuma) is posting about 3 meals (from San Diego). The lettuces were very fresh, the tomato very ordinary, and the dressing seem to be based around rice wine vinegar, miso, and soy. Refreshing. Palate cleansing. The noodles were perfectly cooked, toothsome and tender, but the soup overall was bland. Underneath the fish and friends, the sushi rice was faultless. The toppings presented a nice selection of sushi bar favorites, all good quality and offered good value at $19. We both liked the sizable slice of mackerel and the halibut (hirami), which was especially firm and fresh – in fact, much like the halibut crudo we would eat the next evening at the Wine Vault. We also liked the uni and shiso leaf pairing, and the surprisingly first-rate ebi, unusually meaty and flavorful. The hamachi also stood out. There were no bad tastes, though the slices of octopus and squid were exceeding thin. Overall, we enjoyed. A funny thing happened. Tina and I started looking over the large menu, discussing things, and trying to figure out what we wanted. There were so many choices, and almost every one of them seemed inviting. Twice the friendly server came over and asked if we were ready, and we had to say no because we weren't. Then, when she came over the third time, we ordered two of the most standard dishes on the menu. I'm sure our server must have been laughing with her coworkers about the clueless gaijin taking so long to order such a simple basic meal. But it was good. While the soup lacked a certain depth of flavor, it was certainly tasty, and the interplay between creamy tofu, spicy broth, and veggies and ‘shrooms was pleasant. The bibimbop was great comfort food. The simple meal was really what we wanted. For us, this dinner was, paradoxically, exotic comfort food. She really liked the chicken and the fire roasted veggies (the big zucchini slice and the charred tomato half). She also enjoyed the garden salad with the feta dressing, and we both liked the Shirazi salad with chopped onion, cucumber, tomato, and parsley. For some reason, I chose three slices of sausages, which were okay, but not really unique or outstanding. The baba ghannouj was decent, and the hummus was creamy, but far from the best I've had in San Diego. The chicken wing was OK, the pickled beet excellent, and the beef kebab just okay. Tina and I both enjoyed the stewed zucchini. For me, the breads said a lot about Sufi. The pita bread was pitiful – cool, store-bought, and boring. The Persian bread, on the other hand, was warm, tasty, and probably homemade. But in some ways that is the essence of the restaurant. While it calls itself "Mediterranean," Sufi is really a Persian restaurant that serves some generic Lebanese food to broaden its customer base. I believe the one on the left is called fesenjoom, a chicken and pomegranate stew. 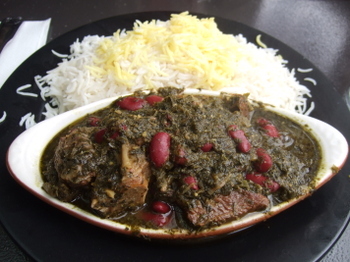 On the right is ghormeh sabzi with a big chunk of tender beef covered in greens along with large dark red beans. 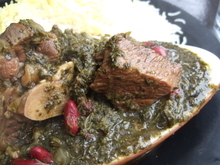 The closest item is, I think, gheimeh, beef and yellow split peas. I have no idea about the green bean stew furthest away. In any case, these Persian stews were the most interesting items on the buffet, and I wished that I had focused on them right from the beginning. Nonetheless, the buffet was interesting and we certainly got to eat all kinds of things we can't get out in the desert. We were expecting something like baklava, but these were different. The pastry was not fila and they were a little more savory and less sweet than baklava. Four years ago Cathy visited the same bakery and hinted that a post might be forthcoming. Hint hint. Anyway, we enjoyed all three of these meals. None was spectacular, but each scratched an itch, and that's a good thing: too long in Yuma and I get awfully itchy. *** Please note - Sultan is back serving kebabs. This time in the Gaslamp. You can read a short post here. This past week we decided to make our monthly drive out to El Cajon. We were craving some Turkish food from one of our favorites, Sultan. You've probably read at least one of perhaps a half dozen posts we've done on the place over the last couple of years. Imagine our shock when we drove into the parking lot and saw "Saray Restaurant" instead of Sultan Kebab & Baklava. We were confused when we saw that the Sultan Baklava sign was still in place. New signs, paintings, and posters adorn the interior of the place and we didn't see anyone we recognized. The folks running the place, a husband and wife team are very nice and welcoming. 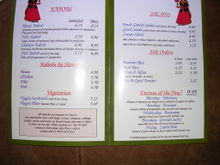 The menu was a combination of Turkish and Persian dishes and a bit confusing. We ended up having a decent dinner; the prices seem a bit lower and the portion sizes a tad smaller. Here's what we had. Since it looks like they're just getting started, I'll reserve my opinions until we revisit in a couple of weeks. We are sad to see Sultan close down the restaurant part of their operation. Sultan inspired us to travel to Turkey, a country we've fallen in love with. Yet, I fully understand why the former owner wants to dial things back and am glad that he is well. Here's a collection of one-off dishes and other miscellaneous stuff from the last couple of weeks. Sometimes a dish will arrive that looks just plain delicious. This was true of the Biber Dolmasi (stuffed pepper) the Missus recently had at Sultan. I just thought it looked so pretty. I'm no great shakes as a photographer; I just point and shoot and after all our meals at Sultan; heck we're there about every other week. I've pretty much keep my camera stowed.....but this one just called for a photo. Cathy and Dennis have already done posts on Balboa International Market. I'll usually drop by for some dates, walnuts, herbs, ayran, and citrus for the Missus. 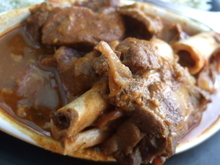 One day last week I was pretty hungry so I ordered the lamb shank on fava rice (sabzi polo). Love the price....$8.99 and it's a load of food. 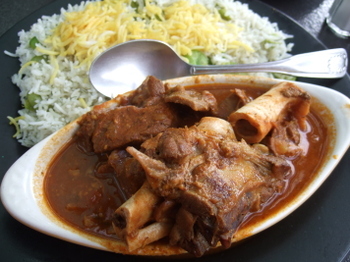 Lamb shank was decent, but the rice was bland and dry....still, the price is right. Not too many plate lunches anymore.......on occasion there's an exception. Here's the Korean Chicken from Homestyle Hawaiian. Shrimp with XO Sauce Chow Fun from Noble Chef......I was lazy and in a noodley mood. Here's the Hu Tieu Mi Kho, which I've posted on a zillion times, from Pho King. Here are the only two photos from a recent meal at Okan, the stewed shishito peppers with ground beef. Which was on the dry and bland side....I'll need to try this again......hope this isn't the norm. Cathy's already done a post on Bristol Farms, but recently I was shopping there, really hungry, and lazy to come home and make something. I decided to try out the Tri-Tip Sandwich ($7.99), without the BBQ sauce. The meat is hand cut and it comes with mashed potatoes and gravy which might have just send me into cardiac arrest after eating all that meat. I subbed it out with a pasta salad. Also, is it just me, or does it seem like Bristol Farms have lowered their prices a bit? Maybe I've been shopping at Whole Paycheck too much recently..... You know, I don't think I'm a cheapo tightwad, who is always looking to get on the better side of the dollar, and like many do believe in the reality of scale. For example a $7.95 dish which is well made from Sab E Lee will not equal to the same dish which costs $19.95 at Lotus of Siam. Of course LOS will be....better be, better, it's 2 1/2 times the price. Still, I do like feeling that I get my money's worth. Every few months, I'm able to break away, and have a nice lunch with the Missus. On most occasions, I'm still in a bit of a rush, so lunch will usually consist of soup from Mien Trung, or something similar. Still, there are those days....when the planets seemed aligned, which are too few and far between for my tastes, where the Missus and I are able to have a more leisurely meal. 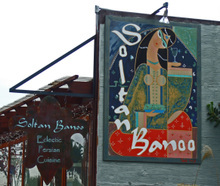 Over the last 6 months, we had the pleasure of having lunch at Soltan Banoo twice. 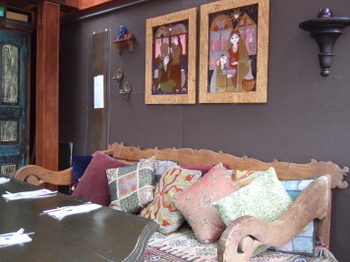 Located on Park Avenue, Soltan Banoo, is a small, cozy, colorful restaurant which seems to embrace you as you enter. In a former incarnation, Soltan Banoo was the Cafe Caspian, the tiny hole-in-the wall across the street next to El Zarape. Mahin, the warm and welcoming Owner of Soltan Banoo, has always been on hand when we've had our meals there, and is quick to explain the various dishes on the menu. 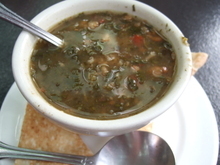 You can tell that there is a great deal of pride in the food that Soltan Banoo serves. Though this was a good amount of food for the price, especially for lunch, I found the Koubideh, while moist, to be under seasoned, and a bit on the bland side. Not wanting to salt the meat, I ended up hitting it with a good amount of Sumac. The shirazi salad (cucumber-tomato salad), was nice, though again, a bit under salted. The roasted tomato was not ripe, and thus very bland. Overall, this was a pretty large amount of food for lunch. The sweet combination of dried cranberries, barberries(aka berberis), orange zest, and carrots proved a bit too much for the Missus. The lamb was very soft and tender, but lost in all the strong sweet-sour flavors. I didn't mind it too much, though I did think that the dish went a bit far over to the sweet side, but that is probably based on my taste preferences. I've found the fare at Soltan Banoo to be lighter, and less salty than what I've previously experienced. The service was very warm and friendly, though it is not a place for a quick lunch. We adore the Owner, Mahin; on our first visit, she came over and chatted about the food, and knowing we weren't from the neighborhood, asked us if we'd be back....our answer was a definite "yes". When we returned a few weeks later, She greeted us with a warm smile, and said, "you know, everyone says they will come back, but you really returned......" And we will return......when the planets are in alignment again! mmm-yoso is being played by Cathy today. Kirk is elsewhere. Hi. I met a friend for lunch the other day, we talked a lot and I did not take my camera. She knew I liked trying different types of food and She likes it here. 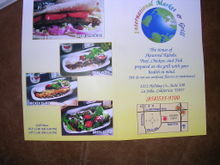 Its close to UCSD, was great Persian food, in a small mall area, run by a husband and wife. So, I went back with The Mister on Saturday. 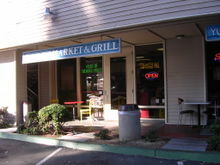 International Market and Grill. There is that one table out front; there are two more inside and a bar seating area also with a total of 6 bar stools. They seem to do a brisk phone in - take out business on weekdays, and actually on the weekend also. The menu is fairly simple. You can get a kebab in a lavash bread sandwich, or on a plate or with a salad. There are 4 types of kebabs: Chicken, Beef Filet (marinated top sirloin), Fish and House (seasoned ground sirloin, ground fresh daily). There is a Garden, Greek or Caesar salad. The plates come with basmati rice and salad. For $1 more you can get herbed rice, which I like a bit better, but was not available on this Saturday's visit. I got the vegetarian plate (salad and rice and a pita). ($5.45). 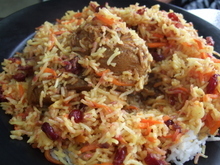 The basmati rice is so aromatic and light, with a dollop of olive oil on top. The salad is mostly romaine, with onions, tomatoes, cabbage, feta and two Bar-B-Qued tomato wedges. It has an olive oil/vinegar/herb dressing and is also served with Must-O-Khair (yogurt, cucumber and herb dip; I tasted mint more than any other herb, it was quite refreshing). 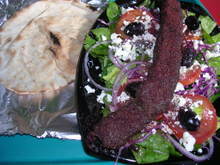 The Mister got the Greek Salad ($5.95) with a House kebab for an additional $2.75. The salad is the same, but larger, with no grilled tomatoes but has more fresh tomatoes, feta and onions and also olives. The kebab, with the ground sirloin and grilled, is very moist and flavorful with herbs. 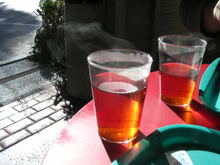 I also ordered two glasses of hot tea ($1.50), freshly brewed and nice and strong. The owner said we could have a free refill. Afterward, The Mister saw this storefront, two doors down, and walked inside while I went to the car. Well, with a name like "Tiramisu"... you know, they had to have something sweet. It's just a fresh made cream puff shell with fresh made custard and fresh made whipped cream...and the nice lady even put a fork in there. All for $2.50 and well worth it. (858)535-9700 M-F 11 a.m.-8 p.m., Sat 11 a.m.-6:30 p.m. 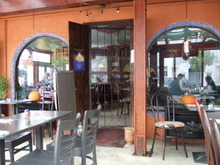 Earlier in the week we did a little window shopping in Solana Beach, and on the way back, I was quite excited to have a chance to have lunch at Alborz Restaurant, which came highly recommended by several People. Located in a strip mall overlooking the I-5 freeway Alborz can be a bit hard to find unless you're actively looking for it. I approached the Restaurant positively excited over eating Persian Food. 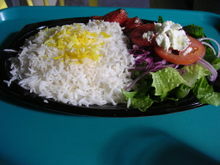 I've only had Persian Food in San Diego, at Bandar, Sadaf, and Parsian Market. And my knowledge is pretty much limited to Chelo Kabobs, Shirazi Salads, and the like. The humble facade hides a a very nice and well appointed interior. We were seated immediately, and looked over the menu. And flat bread was immediately delivered to the table. Along with very pungent and strong raw onion. The large shaker of sumac was also a good sign. 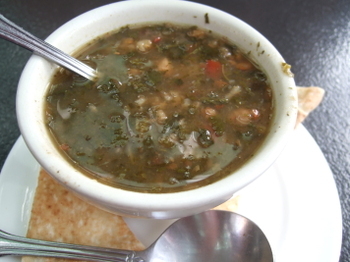 We placed our orders, and were brought some nice lentil and rice soup; well flavored with cilantro and tomato, I really enjoyed the soup. Up next came our appetizer. Now this is where I made a mistake. An acquaintance of mine told me to order something called Panir Sabzi($6.99), telling me it was a "salad" with goat cheese and walnuts. And me being the doofus that I am at times, really didn't do any research, and was kind of confused when it was delivered to our table. There was a small cube of feta cheese, some really good walnuts, scallions, mint, basil, and leek. The Missus and I looked at each other in pregnant silence, until we both broke out laughing. We were waiting for "something else". Having a total lack of any experience with this dish, and having had it described to me as a "salad" I was totally caught off guard. The last time I was served a plate of herbs like this, it accompanied a bowl of Pho'! My bad..... Finally we figured out that you slice off a bit of feta and walnut, roll up the herbs in the bread and eat it. The feta was too mild and totally lost, and the green onions overpowered everything else in the dish. The lamb shank could have used a bit more cooking, but the texture wasn't really bad, though the overall taste was a bit on the mild side. The sauce was well flavored and slightly rich, and the Missus enjoyed this the best. The Shirazi Salad(tomato-cucumber salad) needed a bit more lemon/lime for flavoring, I ended up sprinkling alot of sumac on the salad. The tomato rice was delici-yoso when mixed with the layer of saffron rice, I finished it up in no time. 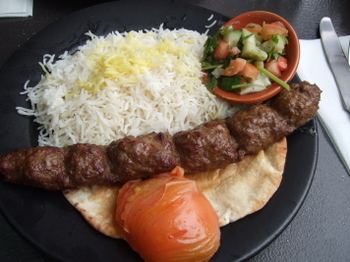 The ground beef kabob was very moist, though very bland, again in need of alot of sumac. The charred tomato was quite bitter. Though the food was decent at Alborz, I really didn't think it's worth making a special trip for. I did Email Howie from A Foodie's Eye View, asking Him what he usually orders. He informed me, that He enjoys the Kobideh, Chicken Kabob, and the Eggplant Borani. I also asked a Co-worker who is Persian and lives in Del Mar, She also seconded the Kobideh, and also enjoys the Kebob Barg. 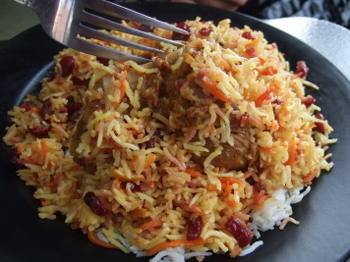 I was also told that the food at Alborz is decent but very "tame". So maybe I'll order one of those dishes if I'm in the area and decide to have a meal at Alborz again. Or maybe one of you can do that for me, and let me know how you like it. 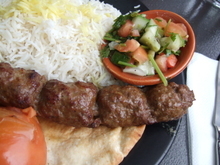 Some notes on Alborz: Service was excellent and very friendly. I was amazed at how quickly we were served. As the pictures detail, the portions are pretty large, especially for "Lunch Specials".